It’s now been well over a week since Daredevil #32 came out so this review is clearly overdue. I will have reason to, once again, get back to the continued flurry of news and hints about what awaits us after Daredevil #36 comes out, but it feels like we should probably get this issue out of the way first! Since I assume all of you have read it by now, there will be spoilers! Needless to say, Mark Waid, Chris Samnee and the rest of the team deliver once more. 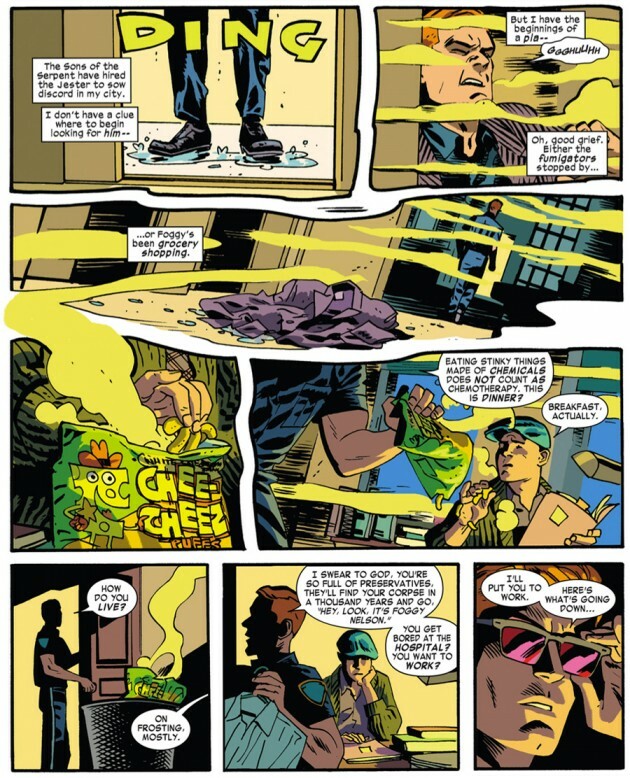 Much of the issue takes place in what is a rather unusual setting for Daredevil, but the story begins where last issue’s cliff-hanger left off, with Matt lured into a trap by the Jester, face to face with someone who appears to be Foggy Nelson hanging from a noose. The Jester’s plan is doomed to failure, however. While he quite obviously knows that Matt Murdock is, in fact, Daredevil, he is also convinced that Daredevil’s blindness is an act. (Not only is this the more logical conclusion, even in a world of super-powered beings, but I can see how a villain with such a passion for theatrics would be even more likely to look for signs of pretense in others.) With this in mind, the scene he has set up is perfectly tailored to someone with the usual set of human senses. Matt, on the other hand, gets something else entirely from the experience, much to the Jester’s chagrin. As always, Mark Waid demonstrates his knack for getting into Matt’s head in ways that I would argue are unparalleled in Daredevil history. 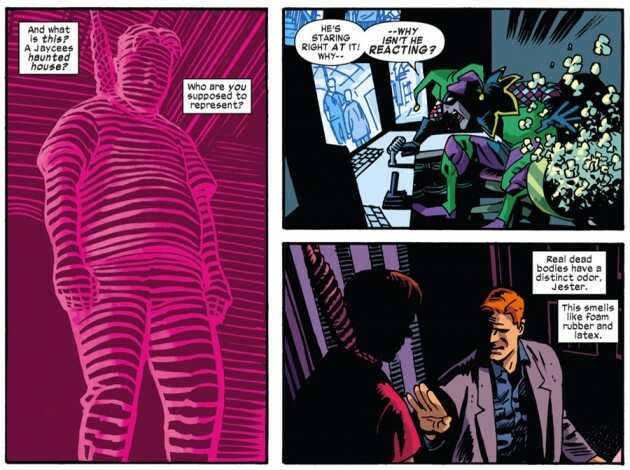 The fact that Matt processes the world around him very differently than the average person frequently makes its ways into Waid’s scripts in important ways, and the first few pages of Daredevil #32 are an excellent example of this. In fact, there are so many interesting layers to it, that I’m going to revisit it in a separate post. With the Jester forced to go to “plan B,” Matt is left having to fight his way out (with very little trouble I might add) while the readers are introduced to the masked leader of the Sons of the Serpent. With little to go on, Matt returns to his office where he finds Foggy, who is busy smelling up the place with cheese snacks, and puts him to work. The two of them start digging up everything they can on the Serpents, in a scene that will eventually take us far from New York and into the second half of the issue. Before we get to that though, let’s stop and admire this scene. First of all, I’m a huge fan of the “smell effects” on the page that sees Matt step out of the elevator. Because, while Mark Waid deserves tremendous credit for doing interesting things with Matt’s senses, the artists who have worked on this book since the very first issue have been just as dedicated to making them visible on the page. Here, Chris Samnee’s liberal use of “cheese fumes” (that’s a thing, right? ), perfectly colored in a nauseating greenish yellow by Javier Rodríguez, combines with interesting panel effects to deliver quite the punch to the nose. All taken together, we really get a sense of just how disturbing, invasive even, the smell of Foggy’s cheese snacks are to Matt. After a brief chat with Doctor Strange, in one of those scenes that seem much longer than its mere two pages, Matt takes a trip to Stone Hills, Kentucky. If Stone Hills were a real town, it would probably be looking to sue Marvel Comics. Since the state of Kentucky is a real place, I’m predicting an angry letter from the governor’s office with Stephen Wacker’s name on it. Joking aside, Stone Hills does not appear to be a very pleasant place, and as revealed through clues that are evident to the reader, but not to Matt Murdock, it is also run by the Sons of the Serpent. Matt doesn’t have to travel far before he finds himself in the middle of a good old-fashioned witch hunt, with an angry mob pursuing two figures that Daredevil can’t even begin to make sense of. The issue comes to an ominous end when Daredevil is hit by what appears to be a stray bullet, but not before he gets the chance to try to figure out the motley crew of characters he just saved and why they don’t particularly seem to appreciate his assistance. 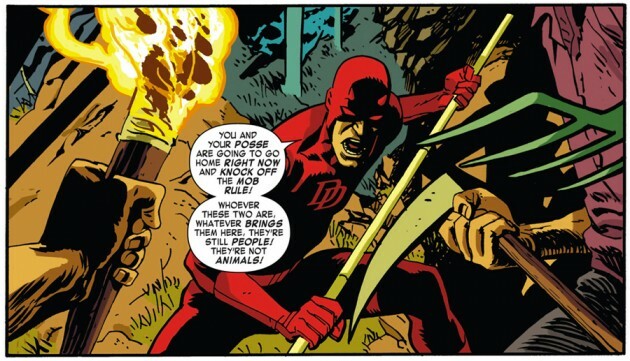 We can see that they look like the monsters of fiction, whereas Daredevil has to try to wrap his head around people who smell like dead bodies and linen. Before rounding off, I want to talk some more about the art. Writing reviews often forces you to try to separate all the different nuts and bolts that come together to make a comic. But that is not how you read the story, and with this book in particular, everyone seems to come together to create something that is so much more than the sum of its parts. As has been the norm lately, Mark Waid and Chris Samnee are co-credited as storytellers, and it is easy to see why. Samnee’s art is so expressive that you could honestly follow the story exceptionally well, even with the captions and word balloons removed. You would certainly still need a script to make a story, but there is just such a wealth of information in the art itself, that I’m blown away by it each and every month. And, Samnee handles all kinds of environments with equal ease. The monsters in the woods inhabit the same world as Foggy back at the law office. It all holds together amazingly well. The overall reading experience also benefits tremendously from Javier Rodríguez’s amazing colors, which give each setting its own distinct feel. This issue, there are frequent changes in scenery, and each scene comes with its own set of sensory associations. The Jester’s house feels damp and dreary, the outside rain looks as cold as it likely feels to the characters on the page. Matt’s office buildings is warmer, but maybe a little stuffy, and Doctor Strange’s house features a more exotic collection of colors that makes you think of precious fabrics and spices. Way out in Kentucky, the town comes across a cold and uninviting, whereas the woods give a paradoxical sense of comfort. I swear I could smell the trees, and hear the torches crackle. For a comic book about a character like Daredevil, it feels appropriate for the book itself to inspire an almost synesthetic experience. I hinted at the pacing already, but I must say that I cannot believe how much wonderful material these guys manage to squeeze into every single issue, something which is particularly apparent when there is this much going on. And yet, it never feels the least bit rushed. Another thing that I always enjoy is the dialogue, which felt unusually inspired this time around. This issue was such a treat, and I’m really looking forward to the next one. Daredevil #33 will have interior art by Jason Copland, but the previews of that issue give some indication that we’re in for another treat! Agreed on almost every point. Especially the amount of material they can include in a single issue. A large number of other writers and artists should take note. The one thing I disagree on is the “cheese fumes” scene. To me it came across as way too cartoonish (for lack of a better word at the moment). Showing us literal green fumes permeating the room was too much. It would have played exactly the same without the fumes, and just showing us Matt’s expression. Also its getting a bit repetitive. I get it. Foggy eats crap. Ha ha ha. It was funny the first few times. I grew up in a small town in Kentucky. “Stone Hill” wasn’t that far off. Thankfully I haven’t lived there in 15 years. Really? I thought Stone Hill came across as kind of a cheesy stereotype–the sort of place I used to see portrayed in the dumb afterschool specials of my childhood, where we all learned An Important Lesson About Racism (and developed a healthy fear of fat small-town Southern sheriffs who call people “boy”). I was rather disappointed in the setting and the cartoonish townspeople, though I was amused at Matt’s equally cartoonish reaction (matching the pious-New-York-liberal stereotype to the racist-small-town cliche). I loved the rest of the issue, though, and am intrigued by Matt’s new monster pals. You definitely get your money’s worth in terms of content with Waid / Samnee. I also use comixology on my tablet for my first read through of new Daredevil issues and whole heartedly recommend it to everyone. Not only does it look great (the images are crisp and vibrant), but you can view the issues one panel at a time, which forces you to slow down and really appreciate the great art and the excellent pacing. Also, Christine, there’s a great panel in this issue where the reflection of Matt’s face in his office window shows his Daredevil mask. This gave me an idea for a post you could do: Like your post about Samnee’s radar, how about a post showing us all the times Samnee has used the Matt’s shadow = Daredevil silhouette trick. It’s so cool. I’ve come to think of it as Samnee’s unofficial DD trademark! You could also highlight some other great examples of his use of shadows too. Just went through my Samnee issues; Chris has used the Matt’s shadow = Daredevil’s silhouette effect at least seven times so far (and that’s not including the reflection effect mentioned in my previous comment). These can be found in issues 12, 15, 18, 21, 22, 24 and 31! Javier also used it in his second issue. There are wonderful small towns across the country full of wonderful people. There are others where its like stepping back into the 50s or 60s. They are out there. Places where people casually throw around words like “colored” and the “n-word”, or at best refer to other human beings as “a black”. I unfortunately visit some of these places regularly because I have family stuck there. If anything Mr. Waid’s cartoonish “Stone Hill” was a very toned down version of reality. The pacing and rhythm of this issue was great, from the Jester’s scenes to puzzling things out with Foggy to meeting Strange to defending monsters to the last page, there was a terrific ebb and flow to this story which I really enjoyed. 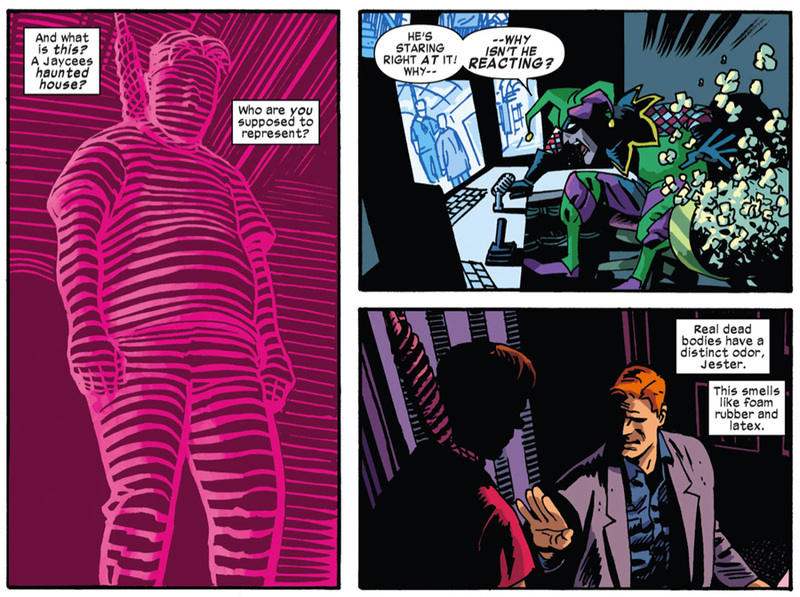 Waid’s interior monologue boxes for Matt are terrific and Samnee’s art was amazing as always. This was the first issue of Daredevil I have purchased in my life. I bought it for the appearance by the Legion of Monsters. Overall I thought it was a good issue. The front half of the comic, with Matt, Jester, and Foggy, was really well done. The “sensory” stuff you mention was impresively done, and really brought a smile to my face. The second half was more problematic. The leftist stereotypes are really overwrought, but I suppose that is to be expected from most writers nowadays. But I did like that Waid had Matt misjudge the situation as a the holier-than-thou urban Liberal, so that balanced things out a bit. The main problem I had with this issue was the Legion itself; no explanation is given as to why they are in Kentucky as they have been in Monster Metropolis, which is in and around New York and New Jersey, for the past few years. Also, Satana has never had any association with the Legion of Monsters as a de-facto organization, so her presence doesn’t make a lot of sense. Manphibian would have fit much better. I will buy the next issue to see how the story wraps up, but I have to say I was impressed enough by the story and art to give some more of this run a look. I have never been a fan of Daredevil but this issue was worth the money I thought. Thanks for the review! Great to have you onboard, Luke! I hope you’ll find all the Daredevil info you need here, if not, ask away!